Alfonso Escamez was the former President of Banco Central. He was appointed President of the bank in 1973 and served as the driving force behind the international expansion of the bank, acquiring Hispanic and American subsidiaries as well as entering the company on the New York Stock Exchange. During his presidency he also expanded Banco Central’s influence by financially supporting the capacity of the Spanish industrial sector. This involved a focus on the petrochemical company Cepsa, of which he was named president in 1984. In the 1980’s Escamez restructured the bank through a flexible system of regulations and in 1991 he successfully merged Banco Central with Banco Hispano Americano (BHA). 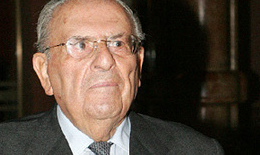 Escamez retired the following year, but was later named Honorary President of the company and remained on the Board of the Foundation Central Hispano.